← Mary Jolliffe, a Canadian Arts Legend. Baltimore Colts Johnny Unitas, 1958. There was a time not too long ago, when I could barely think of NFL football without experiencing pangs of remorse and anger. 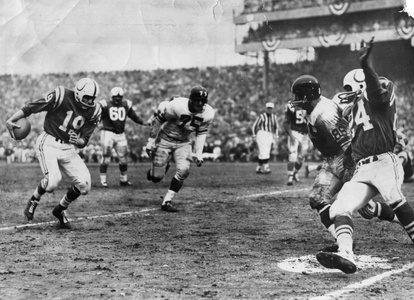 I had been a fan of the Colts since their relocation to Baltimore in 1953. Along with the Washington Redskins, the Colts were the first NFL team to create a fight song, a band to play it and cheerleaders to hustle it. My girlfriend, now my wife, and I greeted the teams return to Baltimore in 1958 after they had defeated the NY Giants in the Greatest Game Ever Played. In 1984, Bob Irsay, the Colts alcoholic owner, moved the team to Indianapolis – a cowardly act perpetrated in an early morning raid on the Colts administrative offices. As the moving vans headed for Indiana, he locked all the doors behind him. The Colts staff arrived for work, and found themselves locked out. Irsay permanently broke the hearts of Colts fans. Another profiteering scrooge did the same to Brooklyn Dodgers fans. We martyrs cannot say Indianapolis Colts or Los Angeles Dodgers without gagging. That’s all in the past and now only persistent but ever diminishing aches remain to remind me of those glorious, sinister days. I’ve gradually learn to live with the Baltimore Ravens, if only because Edgar Allen Poe died and is buried in Baltimore. So, screw Bob Irsay. As Mark Twain said, “Never say anything bad about anyone until they’re dead”. Quoth the Raven, nevermore. Another thing that helps alleviate the pain of losing my beloved Colts is the success of the Ravens and their defensive style of football. After all, they won a Super Bowl and this year my hopes soared when they not only made playoffs, but in the first game they handed Baltimore’s perennial rivals, the Pittsburgh Steelers and their silly towel waving fans, a humiliating defeat. They lost the next game to the New England Patriots, but the defeat of Pittsburgh kind of made the season. Then I resumed watching my next best game, college football. The college game is fun because it’s mostly played by youngsters and bizarre plays rarely seen in the professional game are created by college coaches and flukes. Then there’s the cheer leaders, the bands and the fans. All of these things contribute to a carnival atmosphere. But a creeping professionalisim is threatening the college game. Monday, 14 January 2015, launched the first contest to determine the “real” collegiate national champion, the 2015 College Football Playoff National Championship. The Oregon Ducks was pitted against the Ohio Nuts, or Buckeyes if you will. The buckeye tree is the state tree of Ohio and it produces a nut called Buckeye. 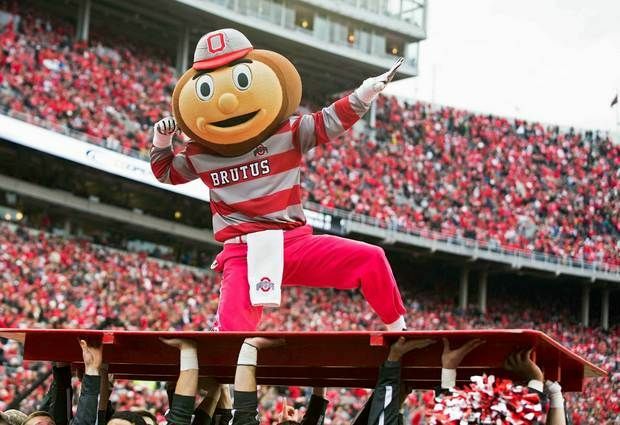 The Ohio State football team mascot is Brutus Buckeye. 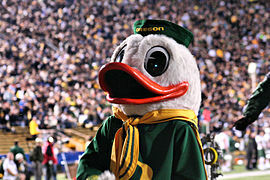 The Oregon mascot is, wait for it, a duck. It looks something like a Disney duck or a Sesame Street reject. The Ducks regular season uniform is almost Day-Glo green with yellow numbers. Ohio’s red uniform was designed back in the 60s by their coach, the legendary Woody Hays. However, for this night in North Texas, both schools broke with tradition. their uniforms were designed by Nike, the shoe company whose logo is already on all NCAA players uniforms and coaches clothing. For Oscar night in the AT&T Stadium, the Ducks became swans, all white with black numbers and pale grey feathers on their helmets and pullovers. Both teams sat on orange colored benches courtesy of Gatorade. I was pretty sure the Ducks were going to win. They play a hurry-up offense which unsettles their adversaries by not giving them enough time to prepare defenses. Their quarterback was the 2014 Heisman Trophy winner. Football players for large schools seem to get bigger every year, as big as the pros. The defensive line of the Ducks had two players weighing in at 290 pounds, one of them 6′ 8″ tall the other 6′ 9″. Both looked slim. I don’t recall Gene Lipscomb’s measurements or weight, but I do believe the big time college guys, particularly the linemen, are apt to be bigger than Big Daddy was. The Baltimore Colts practiced in Westminster, Maryland where I attended high school. One day after school I visited their practice field and stood next to Big Daddy. Those were the days when player’s salaries were counted in thousands rather than millions of dollars and there were no security guards looking out for terrorists. He appeared to be a giant of a man but I don’t think he was 6′ 9″ tall, though he may have weighed 290 pounds. The Nut’s quarterback Cardale Jones, weighed in it 250 pounds! What made him unique in the annals of collegiate playoff was the fact that he was playing in only his third college football game. He ran the Nuts like a professional and made the Duck’s Heisman Trophy winner look absolutely pathetic. After the season opened, Ohio was ranked 18th in the nation – at game time Oregon was favoured by 7 points. The final score was Nuts 42, Ducks 20. Take that, Daffy! Backing up its wunderkind QB, was Nuts running back Zeke Elliott and an offensive line that tore holes in the Ducks defense, allowing Zeke to run for record yardage and four touchdowns. The Ohio defense was just as impressive. Adjusting to the Ducks hurry up offense, after the first quarter, Ohio pretty well shut down the Ducks running and the passing game of their Heisman winner. All in all, Ohio proved to be the dominant college team in the United States. Ohio’s coach, Urban Meyer has now won three national championships coaching two different schools. The University of Ohio pays him $4.5 million a year. The coach of the Ducks makes 2.5 million. No wonder the Ducks lost. I do believe the popularity of the sport is such that it has surpassed baseball to become the national game. A college might field 50 to 100 players, a coaching staff of 15, three or four of them in a booth above the stadium floor, and the games generate untold millions of dollars for their schools, advertisers and television. And so I watch because I love what these kids do on the playing field. They make goofy plays, brilliant plays and stupid mistakes, but they’re excited about the game and make me excited as well. And every once in a while a guy like Ohio’s quarterback Cardale Jones comes along. He was brought up in squalor in East Cleveland and had the guts to call a children’s aid worker and say, “Come and get me. I can’t live like this anymore”. He went to Ohio State as a regular student, only later becoming third quarterback. By an incredible chain of events, accidents to the first and second string quarterbacks, he quarterbacked and led the Nuts in its last three games of the season, defeating three of the strongest teams in America including the perennial and once again favourite for the national title, Alabama. Thus did the Nuts become the first “real” collegiate national champion. In an attempt to escape a large Duck lineman intent on doing him bodily harm, Cardale lost his grip on the football and the Ducks pounced on it. When Cardale reached the sidelines, an irate coach Meyers asked him, “What happened”. Cardale answered, “The ball came out of my hand”. What’s not to like about that!